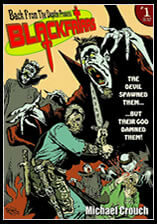 Greetings ghosts and ghoulies and welcome to The Theatre of Terror the home of horror comic news, reviews, classic comic scans and creepy art from around the world. Just remember, it's not for the nervous! 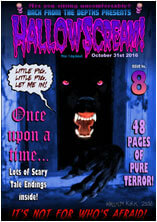 Download the epic latest issue of the Hallowscream horror anthology. Download the eerie eighth issue of the Hallowscream horror anthology. 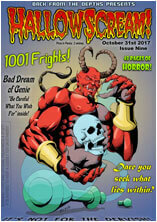 Download the shocking seventh issue of the Hallowscream horror anthology. 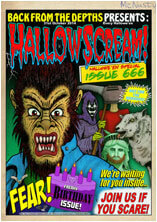 Download the scary sixth issue of the Hallowscream horror anthology. Download the frightful fifth issue of the Hallowscream horror anthology. 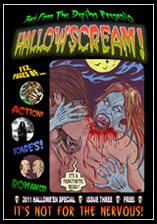 The fearsome fourth issue of the Hallowscream horror anthology. 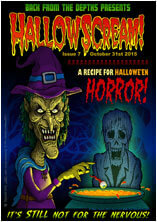 Download the terrifying third issue of the Hallowscream horror anthology. 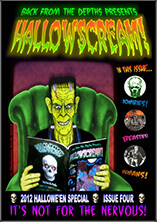 The spooky second issue of the Hallowscream horror anthology. 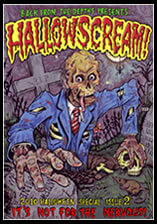 The legendary first issue of the Hallowscream horror anthology. Vampires and Vikings clash in this Scream inspired tale by Michael Crouch. Check out the most exciting comic events for 2012 courtesy of the awesome Down the Tubes. Do you want to join the Scream team? We're looking for enthusiastic people to contribute articles on horror or comics here on The Theatre of Terror. Contact me for more info. The Horrors Of It All is an award winning website which has been delivering top class pre-code horror comic scans for over 10 years. This website is neither endorsed by nor has any association with Egmont UK Limited which is the owner of the copyright in and all other intellectual property rights connected with 'Scream!' The Theatre of Terror is a free service provided for people of all ages to share and enjoy, and to help further enhance the preservation and enlightenment of comic book history and its creators. All images are owned and copyrighted by the respective holders.